Apathy (Demigodz, Army of the Pharaohs) and O.C. (D.I.T.C. 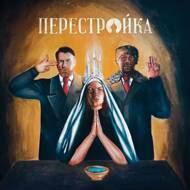 - Diggin' In The Crates) combine forces to form 'Perestroika', a supergroup inspired by the cold war being waged on the rap industry. Anti-mainstream propaganda has become a bit of a cliche, so instead of speaking out against the unflattering direction that today's hip hop music has gone in, Apathy and O.C. have taken action by building a pillar in the ruins of what's left of true school hip hop.